In 20 minutes, anyone can learn all about one of North Carolina’s keystone species with Oysters: A Virtual Reality (VR) Experience, an app designed last fall by students in Associate Professor of Art + Design Pat FitzGerald’s multimedia course. When viewed in a VR headset, the app immerses the viewer in 360-degree scenes filmed at the marshes of Stumpy Point, during the 36th Annual North Carolina Oyster Festival on Ocean Isle Beach, and in downtown Raleigh on Fayetteville Street, where an oyster store once stood. 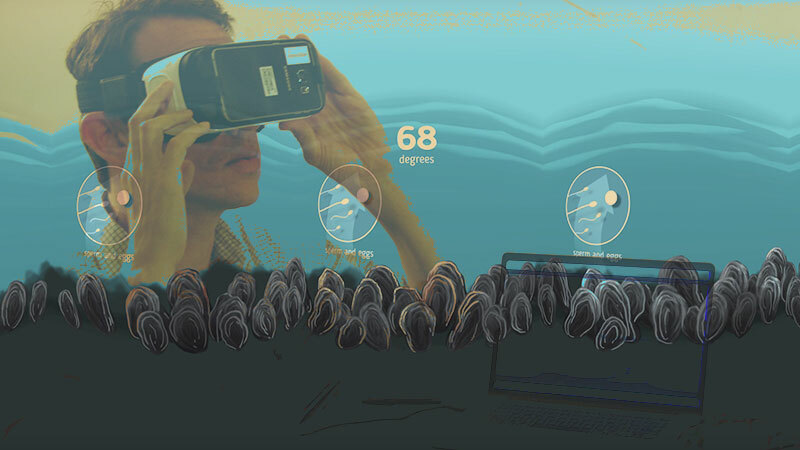 The app blends facts with animations and peaceful lapping waves over an oyster bed, for what FitzGerald calls, “a fun, cultural edutainment: it’s lighthearted, not pedagogical.” Most impressive of all, the app is one of the pioneering VR efforts undertaken by College of Design students, and it was developed by a team with little to no prior experience in VR. “We wanted to venture into VR in a low-tech way, by getting VR into the hands of non-technical folks,” says FitzGerald. Together with Lee Cherry, a technology and research associate, they devised the idea of focusing on VR in the course. They were advised by alumnus Mike Cuales, the Associate Director for Creative & Multimedia Instructional Technology Support and Development. Cuales has led groups at State for faculty and students interested in VR and is familiar with current software and cameras. He led the instructors to Wonda VR, authoring software that offered a storyboard-based approach to the interactions. The program especially appealed to them because it offered “space to take creative risks using new technologies and platforms to express storytelling ideas or narrative ideas in this new medium,” says Cherry. While FitzGerald admits that there hasn’t yet been a “killer app” to propel VR into everyone’s life, its newness lends itself to experimentation and openness. “That’s our job: to try to do experimental things; it doesn’t have to be commercially viable,” he says. And it instills in his students a “creative bravery” that allows them to take risks they might not otherwise feel comfortable with. ADN 491 brought together a multidisciplinary core of students. Last fall, it paired six undergraduates and graduates from a range of disciplines, including a computer science minor, a landscape architecture student, and an interactive animation designer. Each student was given a section to research and build, in order to promote teamwork and give responsibility equally to the entire class. When considering the focus of the class, FitzGerald and Cherry knew they’d like to submit their project to the NCSU libraries’ Multimedia Research Project. This year’s topic is: “The Sustainability Balancing Act: Society, Economy, and Environment.” While looking through back issues of Walter Magazine, it just clicked: The oyster is a North Carolina staple, a creature that has seen population loss and a resurgence, and upon which many technological efforts have been focused. Interviews with Professor of Marine Science Dr. David Eggleston provided much of the audio dialogue for the app. Visits to the state archives revealed turn-of-the-century photos, including the view of the Italian oyster store on Fayetteville Mall, and turned up interesting and weird facts—did you know people once ate oyster-flavored ice cream? One student created animations of the oyster’s lifecycle to accompany narration. Maury Beckmann, a graduate student in landscape architecture, filmed along sounds and waterways on the coast for many of the stunning 360 visuals in the app. After collecting footage, Beckmann used conversion software to stitch it together and then view and use it in a three-dimensional form. To check out Oysters: A Virtual Reality Experience, visit virtualoyster.org.